Nothing serves a hot summer day like a cold, refreshing beer. …Or six. And as a man who has had the privilege of visiting nearly 100 breweries in the furthest corners of the country, I could wax poetic for days over thirst quenching lagers and ales from the far reaches of Humptulips, Washington, to Buttzville, New Jersey. But now is not the time to torture you with talk of rare bottles you'll unlikely ever encounter. Although a great deal of stellar summer beers are regional, available only in the states and cities in which they are brewed, plenty more get distributed quite widely. Some would argue that the quintessential summer style is the American session IPA. And I would argue that the quintessential American session IPA is Founder's All Day. At 4.7% ABV, this easy-drinker defines the term "lawnmower beer": a brew you can, quite literally, drink while mowing the lawn without the immediate risk of dismemberment. While it's light and crisp enough to beat the heat, it also has just enough fresh, tangy, citrusy hops to keep you from dozing off mid-mow. When you're ready to ramp your IPA game up a bit, Ballast Point's Sculpin IPA will deliver refreshment with a sneaky wallop. The tropical, summery fruit aromas and flavors hide the alcohol of this 7 percent ABV beer impeccably well, so keep that in mind when you get the urge to chug. One Sculpin is all you'll need to kick back on the hammock or apartment building stoop. It's an incredibly balanced beer not only great in the summer, but excellent all year round. The Belgian-style witbier that put Maine's Allagash Brewing Company on the map tastes like it was made specifically for summer. This unfiltered wheat ale has a lighter body with a slightly cloudy appearance, while its coriander and Curacao orange peel provide mild spice and fruit notes that seem to scream summertime. Coming in at only 5% ABV, this is another easy-drinker that won't overwhelm you in the heat. Pilsners first originated in the Bohemia region of the Czech Republic, but Victory's Prima Pils represents the German version of this pale lager style with supreme elegance. Its deliciously floral notes give way to a finish that's as crisp, clean, and light as can be. If you're looking for a dry beer to take the edge off the heat, Victory has fine-tuned the art with a subtle bitterness that perfectly balances Prima's 2-row German malts. It wouldn't be a summer six-pack without a saison, the style of pale ale traditionally brewed in Belgian farmhouses during cooler months so hard-working farmers can enjoy them in the sweltering summer. What makes Sofie special, however, is a wine barrel-aging process and a healthy helping of hand-zested orange peel. Peppy, tart, and effervescent with a touch of spice, this is the ideal summer beer for Champagne-drinkers. Okay, maybe it's just all of the memories I have drinking this stuff on the beautiful shores of Jamaica; or maybe it's that cute, little stubby bottle that warms my heart—but I've yet to find a beach beer as satisfying as Red Stripe. Yes, it's an adjunct lager made with rice, but traditionalist haters be damned – this ever-so-slightly-sweet, refreshing brew goes just as well with summer BBQ as it does with jerk chicken. 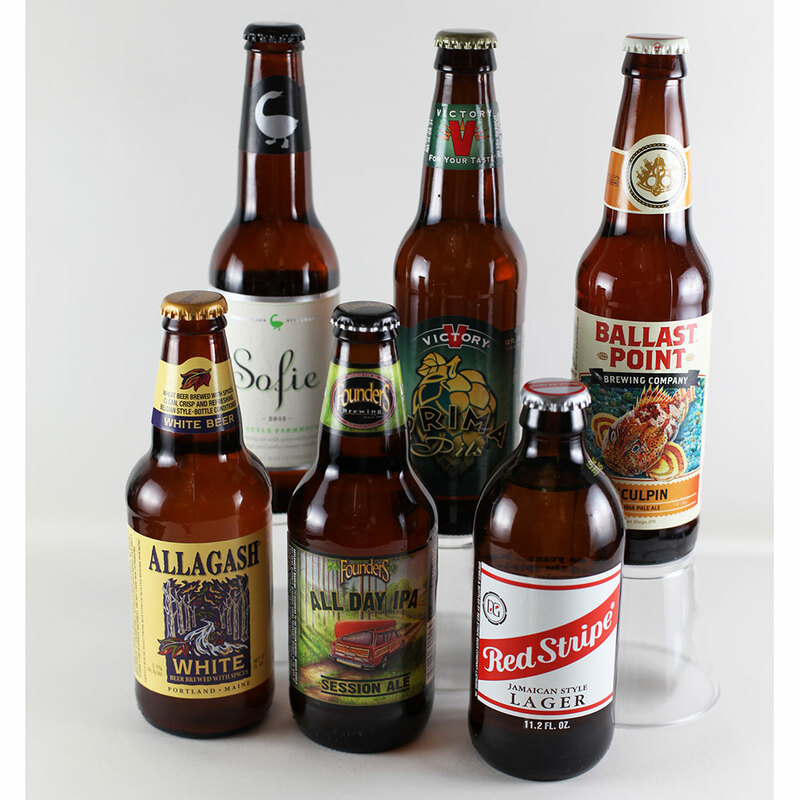 Now that you've met the Dream Team, you can assemble this sixer by visiting most grocers or beverage outlets that offer a decent selection of beer. Or, if you live in New York City, San Francisco, San Diego, Minneapolis, or Washington DC, you can order it direct from Minibardelivery.com, where I've already assembled it for you! Enjoy.